Stephen restores Georgian houses, using traditional materials and methods. Stephen trained as a graphic designer – he and I worked for the same company, publisher Mitchell Beazley, just a year or two apart. He and his wife worked together, but found being busy professionals and good parents wasn’t working, so Stephen became a househusband. 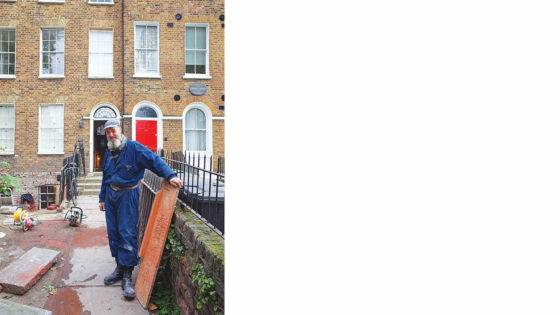 He lives in a Georgian house, and during his now relatively unbusy days, he began reversing the clumsy alterations made during its life, restoring it to its original state. When the house was finished, neighbours were so impressed, he was asked to work on another couple of houses, and that, as they say, is how it all began. There is no book you can read that will teach you everything you need to know. Georgian architecture was not a coherent movement, it covered a hundred years, and by far the majority of the highly variable houses were built by almost unknown developer-architects, often guided by exigencies rather than Palladian ideals. The best way to understand how a house was designed and built is to engage with it. And this is exactly how Stephen works. I visited his latest project on Kennington Road, one of a terraced row, with the house next door boasting Charlie Chaplin once lived there. Light streams in, windows everywhere, most especially lighting the stairs, it is far brighter than a modern house. Stephen starts with the structure, adjusting floor levels, repairing stairs, straightening doors, relaying floors with boards of the right width. The issues are usually a mixture of subsidence, warping and previous fixes. The weather in the 1700s was several degrees colder in Britain than it is now, which caused trees to grow more slowly, with tighter growth rings, making it stronger and easier to carve. Stephen sources pine and larch from Scandinavia, which have a grain close to the pine of three hundred years ago. For repairing walls, he reuses shallow flat bricks from the building itself, using lime plaster with horsehair mixed in. My favourite feature is the window sills, which hinge down to reveal shutters that slip upwards on pulleys. Much of the woodwork in Georgian houses was by carpenters who brought space-saving practicality from other jobs building ships for the Navy. Some things are irredeemably lost. Changing fashion made a previous owner chip away the coving, the plaster moulding that sits at the top of the wall covering the angle that joins the ceiling. Stephen has had to reimagine it entirely, as a parade of acanthus leaves and Prince of Wales’ feathers, a reference to the Prince’s ownership of the manor of Kennington. The floral wallpaper has been reprinted, by hand, from tiny scraps discovered when they stripped the walls. The human hand is in use everywhere, tipping molten lead, chiselling slate, planing wood, giving everything an organic imperfect beauty machines cannot achieve.